The Black Gnat has deservedly had a home in fly boxes for well over 100 years as it is an imitation of a wide number of naturals and has proved to be successful year after year. On both rivers and streams, black gnat clouds are frequently densest over the slower sections. Mating pairs are particularly vulnerable in blustery weather and fall to the surface, where the trout are only to pleased to consume them. 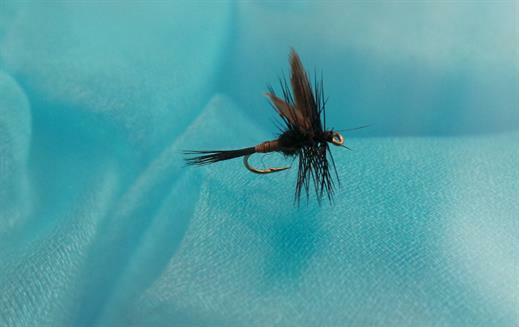 The black gnat is an imitation of a wide number of naturals; producing outstanding sport for us fly fishermen. The naturals land on the water either after mating or are blown there, so the trout young and old are used to seeing this 'pattern' float by! For the lake fisherman, the black gnat is an insect of the margins, often preferring the shade beneath overhanging trees. Any darkish dry fly of the right size (16 or 18) is usually acceptable, provided it is fished on a fine leader. Body : Black tying silk. Wing : White or pale blue dun hackle fibres.Hackle points where possible. Currently there are no comments about the Black Gnat fly pattern from other fly fishermen yet.